Long before superhero movies were packing out multiplex cinemas, Freddy Krueger creator Wes Craven followed-up the success of Richard Donner's Superman with this fondly remembered DC adaptation that brings a comic book favourite to life! Following the success of The Hills Have Eyes, SWAMP THING shows Craven adapting his style from less rough 'n' ready thrills and spills - and the result is an adventure thriller featuring a mutant-monster with good intentions, and a supporting cast of fan-favourites including Adrienne Barbeau (The Fog, Escape from New York), Ray Wise (Twin Peaks, RoboCop) and David Hess (The Last House On The Left) in one of his best-remembered villainous turns. Released in 1982 to an appreciative cult following, SWAMP THING remains one of Craven's most mesmerising achievements - with a faithful DC-comic look and action-packed special effects. 88 Films is delighted to present SWAMP THING in a very special edition Blu-ray release that packs a pristine punch and highlights this creature feature classic in all of its bayou-tinged brilliance! 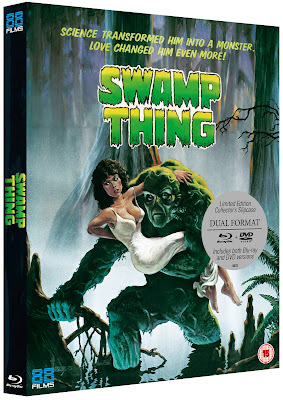 88 Films presents SWAMP THING on Dual Format Blu-ray & DVD 25th March 2019 and can be ordered on 88 films website HERE or via Amazon.